Commonly used for monogramming a person's initial. 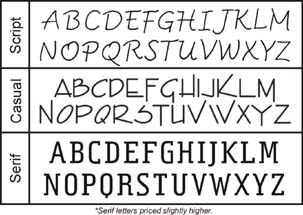 Select the style you like best from Script, Casual, Serif. Then select the letter and size (*1�"-6"), and the type of handle. Branding tip is crafted from stainless steel. *Additional charge for 1�" numbers/letters due to increased labor costs.